This volume, a collection with contributions from some of the major scholars of the Gothic in literature and culture, reflects on how recent Gothic studies have foregrounded a plethora of technologies associated with Gothic literary and cultural production. The engaging essays look into the links between technologies and the proliferation of the Gothic seen in an excess of Gothic texts and tropes: Frankensteinesque experiments, the manufacture of synthetic (true?) blood, Moreauesque hybrids, the power of the Borg, Dr Jekyll’s chemical experimentations, the machinery of Steampunk, or the corporeal modifications of Edward Scissorhands. Further, they explore how techno-science has contributed to the proliferation of the Gothic: Gothic in social media, digital technologies, the on-line gaming and virtual Goth/ic communities, the special effects of Gothic-horror cinema. 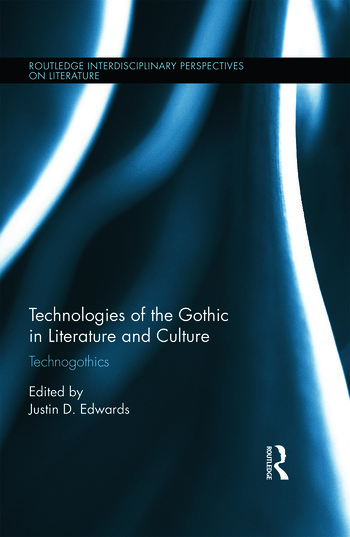 Contributors address how Gothic technologies have, in a general sense, produced and perpetuated ideologies and influenced the politics of cultural practice, asking significant questions: How has the technology of the Gothic contributed to the writing of self and other? How have Gothic technologies been gendered, sexualized, encrypted, coded or de-coded? How has the Gothic manifested itself in new technologies across diverse geographical locations? This volume explores how Gothic technologies textualize identities and construct communities within a complex network of power relations in local, national, transnational, and global contexts. It will be of interest to scholars of the literary Gothic, extending beyond to include fascinating interventions into the areas of cultural studies, popular culture, science fiction, film, and TV. Justin D. Edwards is Professor of English at the University of Surrey. He has taught at the universities of Wales, Copenhagen, Montreal and Quebec. Among his books are Gothic Passages: Racial Ambiguity and the American Gothic (2003), Gothic Canada: Reading the Spectre of a National Literature (2005), Grotesque (with Rune Graulund, 2013), as well as coeditor (with Agnieszka Soltysik Monnet) of Gothic in Contemporary Literature and Popular Culture: Pop Goth (2012).